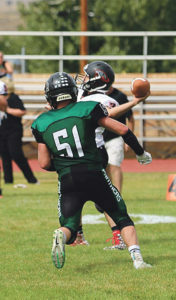 Rangely High School senior Grady Nielsen had one tackle during the Panthers’ winning game against the Del Norte Tigers last week. 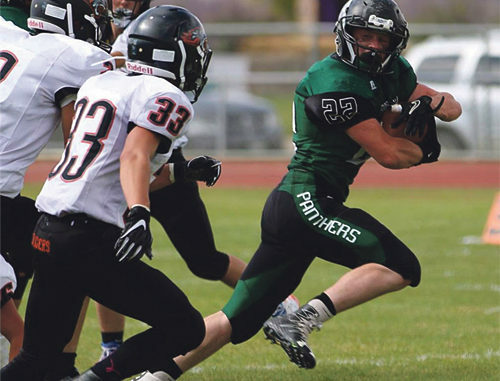 RANGELY | On Saturday the Rangely Panthers had a home game against the Del Norte Tigers. The Panthers started where they left off the week before with a strong first half, out-matching the Tigers 52-7 in the first two quarters. Scoring started with a 10-yard run by Devin Ramirez and he added the two-point conversion as well on the ground. The Tigers answered with a 25-yard strike in the air. After that the Panthers started to dominate the game with Coombs adding a 55-yard run for a touchdown immediately. Rangely’s defense had a strong day as well, only giving up slightly less than 150 yards of offense. The Panthers finished the half with scores in the air from Drew Brannan to Devin Ramirez twice and then rushing touchdowns from Brannan, Ramirez, Coombs and AJ Lujan. The Panthers are off to a great start, 3-0, and host Vail Christian for their first league game this Friday at 7 p.m.